You may select one or more modules to delete at a time. 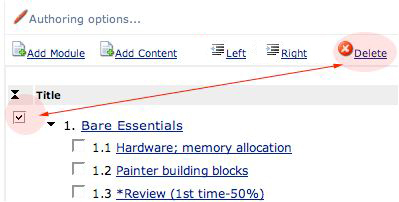 On the Author View page, choose the module(s) you want to delete by clicking the checkbox left of the Module title. Then, click the Delete link at the top of the window. If you are sure, click Continue to delete the module. If you are not sure about continuing with the deletion, click Cancel to abandon the process and return to the Author View page. A confirmation page lists the module that you deleted. Click Return to Modules to return to the updated Author View page. Note: You can delete sections, also. And you can delete sections and modules both at the same time. Please read the module on sections for more information.